Salwar Suit being most preferred apparel of Indian women has its place in wardrobe of almost every girl /women . Reason – Its gives a decent look . When paired with a nice dupatta , it gives a lovely traditional look . Salwar Kurta or Salwar Kameez is a traditional outfit originating from Indian Subcontinent. It was originally traditional dress in Punjab region but slowly gained popularity and became common in every part of country. One can know more about it at wikipedia . One can buy salwar suits from Online stores or from Malls or small shops in their city . But past few years more and more people are placing order online for salwar suits . which is otherwise difficult to get. Like we can shop Bandhej Suits of Rajasthan ,Lucknowi Chicken suits or Kashmiri suits . This makes shopping exciting . * Shopping online is easier as compared to visiting various stores . I am also doing online shopping past few years and have shopped Salwar Suit many a times and was happy and satisfied that I could get good products at discounted price. It’s a famous online store and it even has a TV channel from where one can place order , So it becomes easier for anyone to place order at this site . One can get wide range of products at this store . Regarding Salwar suits one has more than 8000 options to choose from. 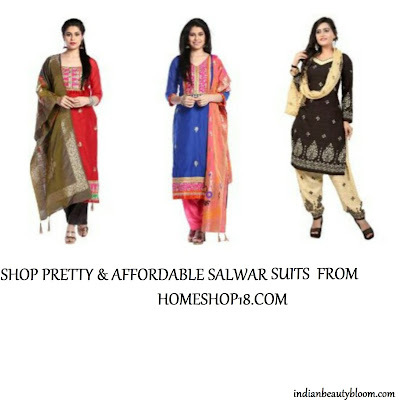 One can shop latest design salwar suits from Homeshop18. Palazzo , Anarkali or a simple salwar suit everything is available there. There are various filters by which one can select their favorite one . One can also look for some deals or offers to get good discounts . This is a Georgette Embroidered Party Wear Suit . Looks too good and can create a stunning look. Available at a 50% discount it makes a good deal . I love such suits as they are comfortable and Classy and makes one feel like a DIVA . This is a beautiful Anarkali Salwar Suit . Heavy work in the kurta makes it stand out in the crowd . Available at a discount of 58% , it makes a great deal . Ideal for a party or a function. When matched with ethnic jewelry will give a true Indian Look . One can buy suits like this for daily wear . They are comfortable and gives a simple yet elegant look . Cotton Salwar Suits like this are ideal for Indian Climate as we sweat a lot in summer and cotton suits like this one are gentle on skin and comfortable to wear . With its vibrant color and design it makes one feel beautiful. So these are the ones I liked , Do check the store and check their collection of salwar suits , one can avail good discounts on many products . There are various videos available on Youtube from which one can easily learn cutting and stitching of salwar suits . It’s not that difficult and one can give a try . One can shop dress material from Homeshop18 and can try to stitch their own salwar suit . * Wide range of options , One can choose as per their choice and budget . * Salwar Suits of different type from different parts of India available here . * Good discounts and deals . * One can also select product as per Customer Rating. * One can pay via various payment options like Credit card , Debit Card or COD . * Easy returns and exchange .